[Madison, Wisconsin]: ORCS, 2017. Edition of 5. 14 x 8.75"; 215 pages. Printed on vellum. Signed and numbered by Maddox. Bound in blue cloth covers over boards. Christopher Maddox: " ǂ(antiparallel) investigates shifts of meaning that occur when prose is translated. This analytical and poetic study is built from two versions of The Garden of Forking Paths by Jorge Luis Borges: a version translated by Borges and his close creative partner Norman Thomas di Giovanni, and a more recent Penguin Classics release, translated by Andrew Hurley at the bequest of Borges’ surviving heir, Maria Kodama, who wanted to cut di Giovanni out of a royalties contract. "A central theme, conveyed in the title of the story, is the notion that one might imagine a multiplicity of personal existences, each of which expresses a choice made in life that initiated a sequence of events and a particular existence – parallel but unique realities. 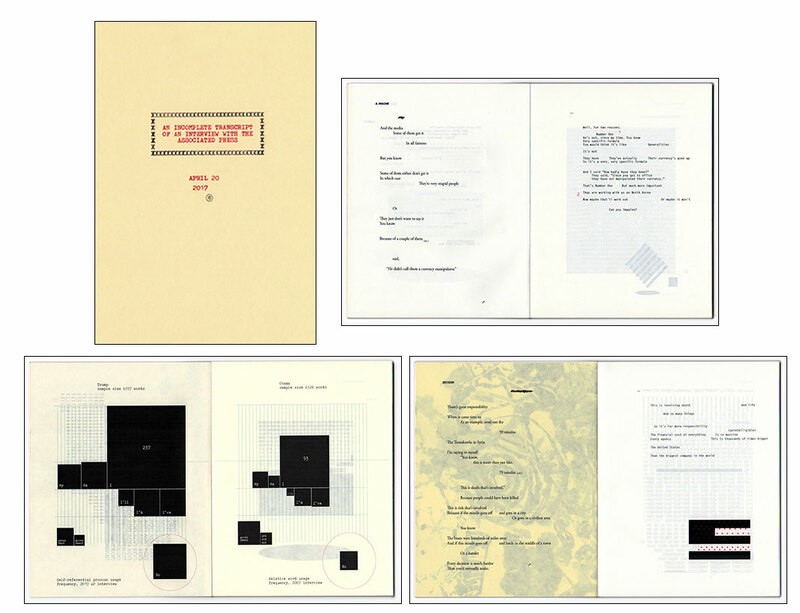 Such paradoxical antiparallels are mirrored in the text-based works of my project – particularly the enclosed book which presents a line-by-line analysis of two translations in their entirety. This piece reveals the complete body of discrepancies between two translations, and in so doing provides insight for the reader into difficulties inherent to translation. 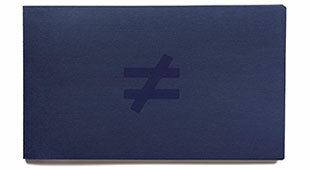 It is at the same time a concrete poem, conveying concepts embedded in the texts through its own typographic form of two parallel lines of text, that are paradoxically equal and not equal simultaneously. "Borges’ characters discuss a mythical labyrinth, and I believe this conversation alludes to the impossibility of seeing the true nature of our predicaments for want of a view of the total territory we occupy. Antiparallel searches for connections between this labyrinth and the paths we follow through living that offer continuous choices. It explores how paths not taken may linger in the mind and develop into persistent fantasies, ruminations, or narratives of desire and conquest. It suggests that dreams are constructed from the vapors of roads not taken." [Madison, Wisconsin]: ORCS, 2017. Edition of 300. 6 x 9"; 84 pages. Softcover. Screen printed dust jacket. Signed and numbered by the artist. Christopher Maddox: "Fake Art! is a series of statistical and poetic text analyses. Each piece imposes audacious task-reassignments and other structural manipulations to shift tone and meaning of the words broadcast by contemporary political figures. Book #1 focuses on interviews given by Donald Trump with the Associated Press and Time magazine in 2017. The new iteration may appear elevated, degraded, or a combination of these that can both satisfy and disturb the reader. The reader's experience will depend on perspective and attitude – on the sum of one's encounters with the world, and his or her confirmation bias. 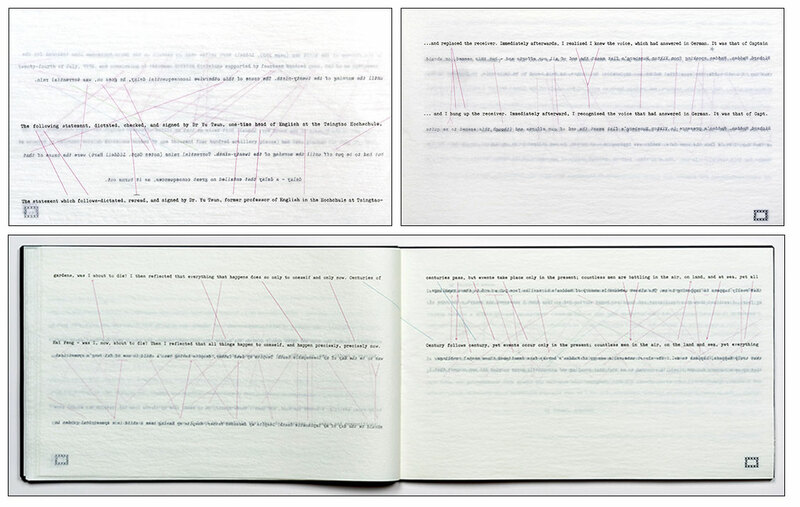 "The texts presented in staggered, narrative poetic form within are not redacted. Each such page presents a single transcribed response in its entirety as spoken by President Trump. Typographic formatting has been altered to deliver a more palpable facsimile of the conversation. Interviewer language has been compressed to obscurity." [Madison, Wisconsin]: Christopher Kit Maddox, 2014. Edition of 10. 11.625 x 14.625" case containing 18 leaves (17 prints + introduction). Media: archival inkjet, monoprint, graphite. 11 x 14" leaves, each signed, numbered, and titled on reverse side. 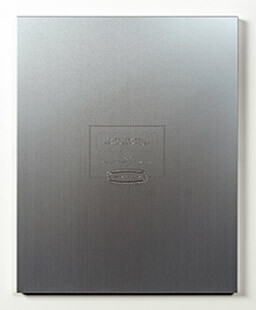 Laid in case of engraved aluminum outer shell with hand-made mohair fabric-covered insert. Christopher Kit Maddox: "I actually decided to get this project into production as a portfolio edition because I was asked by an institution to commission one for their collection when they saw it on my web site, and decided I'd love to produce it as an edition and get it out there to a handful of places. 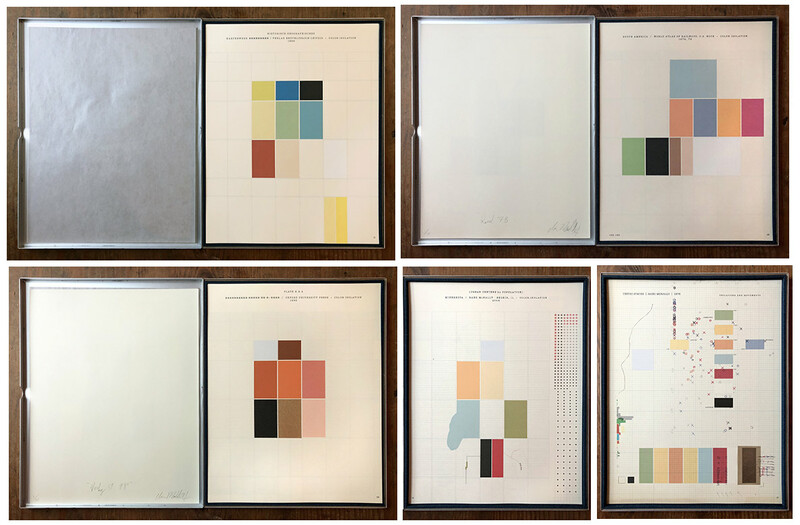 "Each print is a partial-abstraction of a printed geographical map which has been distilled to, in most cases, only the colors and the visual qualities of the lines that were used in the originally published map. I use Pantone Matching System process color guides to accurately reproduce the color palettes present in the source material. In some cases, additional other elements of a map are retained, but the end result is still an abstraction of an original printed map. Many of the source maps were found in the Cartography Library collection at the University of Wisconsin's School of Geography. The rest are old highway maps from my personal collection. The title 'Terra Obscura' describes this game, referencing 'territory' and my 'obscuring' of its representations. 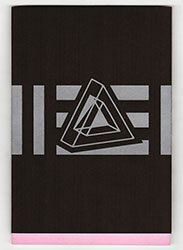 "The project is one I regard as 'post-digital' printmaking/art. It's a response to the migration from the tradition of printed maps to GPS and the digital tools used today for navigation and geographical/scientific spatial analysis — hence my interest in exploring alternative roles for printed maps — as visual art objects and cultural commentary by way of their visual deconstruction and reconfiguration. There's a bit of non-sense involved in the forms I create, and that is intended as a commentary on my belief that maps tend to function well only for a pretty narrow or specific purpose, and if one were to attempt to use a particular map for a purpose for which it wasn't made, it would be absurd. For example, a topographical map might help me plot a walking course but could not help me to avoid bears or hostile natives. The maps in 'Cartographic Fragmentations' are each confusing because the spectator is missing the necessary and conventional cartographic cues to help them know how to use them, and experiencing that confusion is exactly the point of the project. A bit like receiving an unassembled IKEA shelving unit mysteriously deposited on one's doorstep without the instructions."